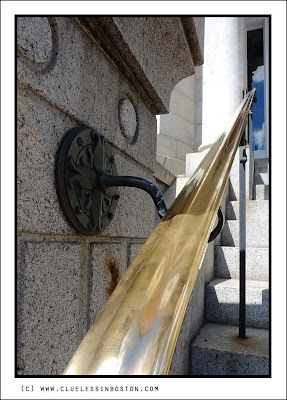 Brass handrail seen on Beacon Street. You take simple things and make beautiful pictures. I like the dynamic of the diagonal in this one. I love the way you present your photos too - they look so crisp with the border and black outline. I'm enjoying your blog and thanks for visiting mine. The railing seems to point to a patch of sky, a reflection, maybe. Good idea, love the polished diagonal and the greyish colors around. Excellent title for this image. It really is all about the handrail, which, as VP said, is such a sleek, fast diagonal. Perfect example--- sometimes it's the forest... today the trees. Nice! Simplicity! This is original and fantastic! Got to hand it to ya, that rail is nicely composed! This is a beautiful picture. I like how the are all align.